I’m cheerless at weddings, but almost entirely, wholly, and I’m convinced it’s not a bad idea at all to spare people I like the sight of me standing around, mostly mute, with a drink I don’t want in my hand. Trumpeter and flugelhornist Clark Terry is one of seven musicians receiving Lifetime Achievement Awards today from the National Academy of Recording Arts and Sciences. The other honorees: Leonard Cohen, Bobby Darin, David “Honeyboy” Edwards, Michael Jackson, Loretta Lynn, and André Previn. I was lucky to do a radio interview with Clark Terry some years ago, when I was putting in two hours a week playing jazz at my university’s FM station. (The station then aired four hours of classical music and five hours of jazz a day, with bluegrass, blues, hip-hop, indie rock, and reggae in the evenings. Now the station plays “hits.”) Clark was on campus to lead a workshop and perform, and had agreed to come over to the station in the afternoon for an interview. He and I talked for an hour on the air. I consider that hour one the most memorable experiences in my life: the opportunity to talk not only with a great musician but with a great Ellingtonian. It was a really good interview. The interviewer, as you might imagine, had done his homework. The Grammy Awards air tomorrow night on CBS, 8:00 Eastern Time. I hope that the Lifetime Achievement awardees get more than just a perfunctory roll call. We’ll see. Moon life becomes you. It goes with your hair. You certainly know the right thing to wear. Would anyone care for more cheese? There seems to be a new person working the line at Hi-Lo Amalgamated. Interstice problems — the changing door, the changing greenery, the disappearing picture — are the same old same old. What’s new: the Flagstons’ front door now opens onto the sidewalk. Lawn, goodbye, for now. Boy, when you’re dead, they really fix you up. I hope to hell when I do die somebody has sense enough to just dump me in the river or something. Anything except sticking me in a goddam cemetery. People coming and putting a bunch of flowers on your stomach on Sunday, and all that crap. Who wants flowers when you're dead? Nobody. The New York Times reports that there will be no service. 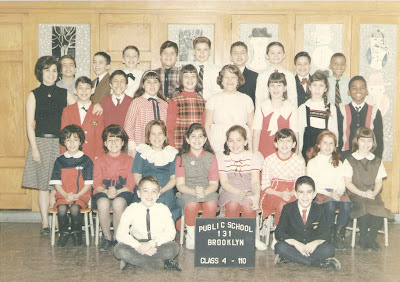 The above photograph shows Mrs. Marcia Schorr’s fifth-grade class, P.S. 131, Boro Park, Brooklyn, New York, 1966–1967. Not a cross tie in the crowd. I remember Mrs. Schorr as very capable, very calm. The envelope that holds my fifth-grade report card holds a note from her to my dad (on a note-card, in an envelope, of course), thanking him for a card he had made for her. Mrs. Schorr was wishing us well on leaving the city for New Jersey: “Brooklyn will be losing a fine family!” What a gracious and generous thing to say. As a kid, I liked the effect that the horrible lighting had on the boys in the top row: it gave them long hair. Looking at this photograph now, I wonder whether Albert’s shirt pocket (third row, middle) was holding what we called an I.D. wallet. Such wallets were accessories in our work as school-aged secret agents in The Black Cat Club. (Secret agents always carry I.D., right?) 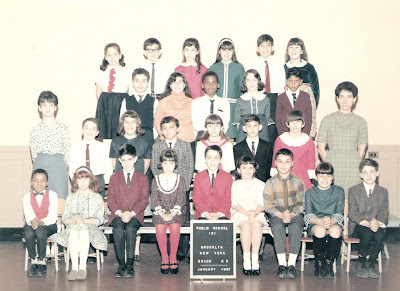 And I now remember something I haven’t thought of in years: a lunch hour during which Donald (top row, left) and I stood on safety patrol and I told him what menstruation was. My mom and dad believed in reality-based parenting — no birds, no bees, no storks. That concludes class pictures at Orange Crate Art. In the suburbs of New Jersey, all school pictures were of individual students. So the class picture was a set of separate little rectangles on a white background, young suburbanites each with her or his own little bit of property. Miss D’Elia was the first teacher to let me know that she liked me, that she thought I was a good person. Her arm around Eddie (for that was his name) says much about her feeling for her students. Eddie must’ve felt like a million dollars. At some point in that school year, Miss D’Elia became Mrs. Corso. Her students and their families were invited to the wedding. I remember shaking Mr. Corso’s hand. Mr. Corso was a lucky man. See? Little ladies and gentlemen, every one of us. Still our teacher is not satisfied. She turns to principal I.O. Gimprich. Why me? she asks. Just because, says Dr. Gimprich, climbing a wall, just out of the picture. 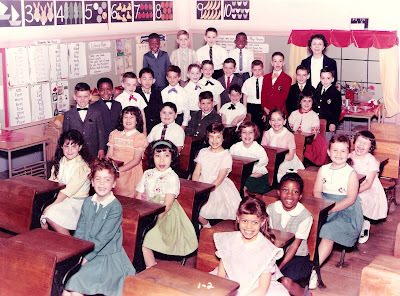 The above photograph shows Mrs. Roslyn Vistreich’s third-grade class, P.S. 131, Boro Park, Brooklyn, New York, 1964–1965. Mrs. Vistreich was not my favorite teacher, nor I her favorite pupil. She called me a clockwatcher — at 2:58 or 2:59, if you can believe it, which you should, because it’s true, I think. She called me Mr. Dooley, perhaps a diss of my Irish-American ancestry. She didn’t like my habit of whistling (melodies, not wolf calls). She charged me — on my report card — with being a danger to myself and my classmates: “Must try to walk up & down stairs more carefully to avoid accidents to self and others.” Yet she sent me off during class time to travel from floor to floor delivering notes to other teachers. I read the notes and found out her first name. I once told a joke about Schaefer beer in Mrs. Vistreich’s class. Surely it confirmed whatever she already thought of me. But still, I “did good.” Under the words “Our Best Work” is my report “Building Materials.” It’s the one in the middle, the work of a tileman’s kid. Do click for a larger view and enjoy the props on the desks, which I don’t think were standard in class pictures. Look at the MacBook on Barry’s desk. How’d that get there? Dig the flag. Dig the hairdos. Dig the cross ties. (They’re coming back; I know they are.) Dig the diamond-shaped tie of the boy in the top row, middle, a tie whose proper name escapes me. Dig the glasses of the girl in the middle row, left. Dig the glasses of the girl in the middle row, left. Yes, I said it again: her glasses are that cool. Extra credit if you recognize any of the kids from Mrs. Frazier’s class. 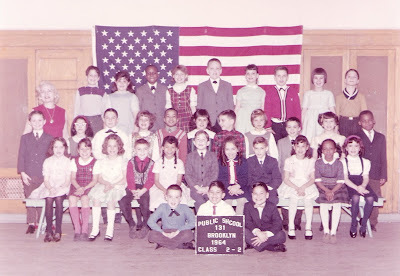 The above photograph shows Miss M.’s second-grade class, P.S. 131, Boro Park, Brooklyn, New York, 1963–1964. I remember my second-grade classroom as something like a performance space for teacherly fury. Miss M. once tried to quiet us by throwing her shoes into the “cloakroom” as we bundled up to go home. A teacher throwing shoes? The response is likely to be helpless, giggling frenzy, as of course it was. On another occasion, Miss M. tried to quiet us by lifting and dropping one corner of her desk. Dr. I.O. Gimprich, the principal, happened to be walking by in the hallway. The noise brought him into the room. Was everything okay? Yes, it was. I wonder what became of Miss M., and I wonder what might become of anyone trying to teach thirty-four second-graders. Looking at class photographs from P.S. 99 moved me to make my own small contribution to grade-school nostalgia. Here’s the first of five class pictures that my parents handed over to me some years ago. 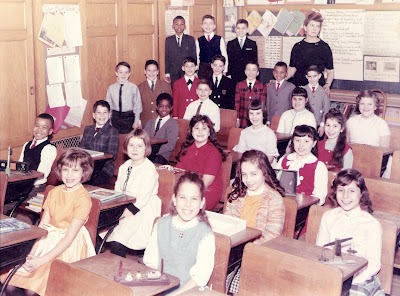 The above photograph shows Mrs. Frazier’s first-grade class, P.S. 131, Boro Park, Brooklyn, New York, 1962–1963. Mrs. Frazier was my mother’s first-grade teacher at P.S. 131 in the late Depression, a fact of our family life that still amazes me. I like seeing the details of this classroom, which looks like a lively place (especially with thirty-one kids). I remember reading at a table off to the side of the room with my friend Barry (sitting, wearing a cross tie). We must have been in the Library. I believe that we were ahead of the class, reading-wise, and that Barry was ahead of me. Syd Hoff’s Danny and the Dinosaur was my book of choice. Note the Play House: “We can have tea.” And we still can! Do click for a larger view. The girl in the saddle shoes rules. 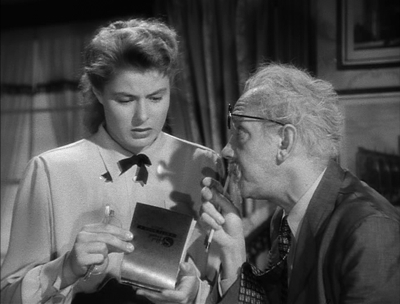 Dr. Petersen’s pocket notebook holds the details of a dream reported by her amnesic patient John Ballantyne (Gregory Peck). That dream in turn holds the secrets of Ballantyne’s identity and his guilt complex. Ballantyne: Professor, I never quite realized in my amnesic state how lovely you are. Petersen: Oh, now that you got your head back, you mustn’t lose it again. Ballantyne: Oh, no. It’s too late. I’m beyond cure. It’s National Handwriting Day (aka John Hancock’s birthday). Above, a recent sample of handwriting, created with a portable ink-delivery apparatus called a “Model T.” Yes, handwriting recalls the good old days, like the day last week when I wrote a review of Alvin Levin’s Love Is Like Park Avenue (New Directions, 2009) for World Literature Today. Handwriting is not dead yet. Firefox 3.6 is now available. It feels very fast, much faster than 3.5. Scientific testing confirms: fast! The big new feature of 3.6: Personas (Personae?). I’m happy with the GrApple Delicious theme for Mac. No Personae for me. Geoffrey Chaucer, Ezra Pound, B.P.E. Anyone who is too lazy to master the comparatively small glossary necessary to understand Chaucer deserves to be shut out from the reading of good books forever. Ezra Pound, ABC of Reading (New York: New Directions, 1960), 99. I remember that I used a large paper clip to hold together the thirty or forty pages preceding the glossary, which was, yes, small. The clip made it easier to flip to the glossary and not be shut out from the reading of good books forever. It was life B.P.E. (Before the Post-it Note Era). The nationwide sale of Post-it Notes began in 1980. Acocella’s piece appears in the December 21, 2009 issue of The New Yorker (online for subscribers only). Promos showing a group of young men and women of Italian heritage making entertainingly ridiculous statements about themselves and whooping it up on the boardwalk at night — dancing, throwing punches, that kind of thing — advertised “Jersey Shore” as set in a “house like you’ve never seen, full of the hottest, tannest, craziest Guidos,” and Italian-American groups, and eventually New Jersey tourism officials, protested and some of them called for MTV to cancel the series. One problem: the number of participles separating subject and verb: Promos [showing, making, whooping, dancing, throwing] advertised. A second problem: the number of ands as the sentence ends: “and Italian-American groups,” “and eventually New Jersey tourism officials,” “and some of them.” A third problem: the missing comma before the and that begins the sentence’s final clause. 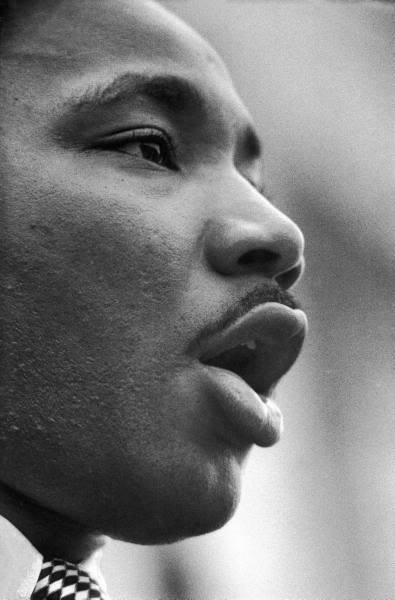 One more: “some of them” seems ambigious: some of the officials who eventually protested? Or some of the groups and officials? MTV advertised “Jersey Shore” as set in a “house like you’ve never seen, full of the hottest, tannest, craziest Guidos.” Promos showed a group of young men and women of Italian heritage making entertainingly ridiculous statements about themselves and whooping it up on the boardwalk at night — dancing, throwing punches, that kind of thing. Italian-American groups and New Jersey tourism officials protested, some of them calling for MTV to cancel the series. The ambiguity of some remains. I’ve let the word apply to both the groups and the officials. And if you’re wondering: I’ve seen enough of Jersey Shore to have seen enough of Jersey Shore. “Gettin’ inside the joint,” one crony suggests. And there the scene ends. Ma Jarrett (Margaret Wycherly) is Cody’s ultimate authority, his ultimate consolation, his muse. “And according to Ma”: the fall of Troy is her story. This bit of dialogue is from White Heat (dir. Raoul Walsh, 1949), the best Cagney film I’ve seen. White Heat makes fascinating the sheer drudgery of crime: planning routes, designating drivers, packing, unpacking, checking the time. It’s a film with something for everyone: a great train robbery, a morgue scene, snappy police work (teletype machines, car phones, radio transmitters, wall maps), spooky facial bandages, a car chase, vast prison interiors, an explosive ending. Best of all are the film’s breathtakingly twisted relationships. Only ten minutes into the film, Jarrett seeks his mother’s lap to be comforted. His relationship with his snoring, spitting wife Verna (Virginia Mayo) is a mess of physical and emotional tyranny: there is room for only one true romance in his life. His moments of sudden violence, toward Verna and others, take us into the realm of pathology. White Heat pairs well with other Cagney films: The Public Enemy (dir. William A. Wellman, 1931) and Angels with Dirty Faces (dir. Michael Curtiz, 1938) are the obvious choices. To my mind though, the ideal partner for White Heat is not a Cagney film but Walsh’s High Sierra (1941). If White Heat gives us the gangster as psychotic killer, Humphrey Bogart’s portrayal of bank-robber Roy Earle gives us the gangster as damaged saint. Earle heals the lame (or at least covers the bill) and inspires devoted followers, one of whom unwittingly betrays him, one of whom weeps for him. The two films together are a fine introduction to the fascinating and repellent figure of the criminal in American screen culture. Appetizing: adjective, or noun? Discuss. American weatherpersons often speak of “intervals of sun.” “Sunny intervals” sounds brighter and more cheerful. I’d like sunny intervals, soon. 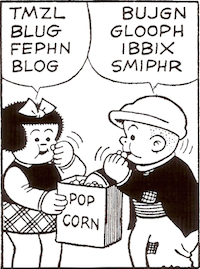 If you dislike Blogger’s odd spacing before and after block quotations, here’s a fix. Change the em number to match the line-height you found above, as I’ve done here. That’s it. See? The oven is not exactly our old one though (pace Elaine). Look here. Churchill’s speeches, Hemingway’s style and Golding’s prose would not have been appreciated by a new computerised marking system used to assess A level English. The system, which is a proposed way of marking exam papers online, found that Churchill’s rousing call to "fight them on the beaches" was too repetitive, with the text using the word “upon” and “our” too frequently. . . .
Schmoozing the teacher, sure, but I’ve not heard of schmoozing the computer. A Google search points again and again to this Telegraph article. I’d like to know what’s involved in computer-schmoozing. From a commercial for the United States, in a dream earlier this morning. Talking with Rachel Maddow on MSNBC last night, Tracy Kidder recommended Partners in Health to anyone interested in donating money to help Haiti. Kidder is the author of Mountains Beyond Mountains, about PIH co-founder Paul Farmer. Useful for all students of writing. Above, the main headline at the Huffington Post right now (where it appears at about twice the size). Reading it, you would click, without even thinking, anticipating the news of a catastrophic aftershock. And you would not find it. What you would find is a report on the earthquake’s aftermath. The Huffington Post is notorious, in my house anyway, for its cynical efforts to increase page views. Click on a headline to read a story; get a page with that headline, no story; click again. It’s difficult to decide whether the above headline is a matter of an ill-considered metaphor or the work of the Department of Page Views. At any rate, it helps to explain why I’ve begun to get the news from the BBC. Sue Shellenbarger updates readers on her experiment with three time-management strategies: FranklinCovey’s Focus, GTD, and the Pomodoro Technique. The final piece, with Joe Turner (piano), Hans Rettenbacher (bass), Stu Martin (drums), was likely created on the spot. “Caravan” is the highlight, I’d say; “Satin Doll,” a charming surprise. “Caravan,” “Solitude,” and “Sophisticated Lady” appear on the 1955 Riverside LP Thelonious Monk Plays the Music of Duke Ellington. What did we do before YouTube? Without. Ringo Starr’s album Y Not, out today, has a significant contribution from Van Dyke Parks. The above scene is from “Betty, Girl Engineer,” an episode from the second season of Father Knows Best, first aired on April 11, 1956. 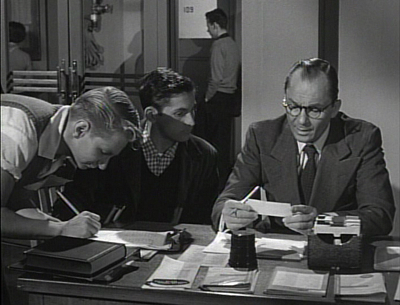 The plucky card-file, a newcomer to the home screen, upstages Mr. Glover (Jack Harris), a clipboard, and several unnamed students who have been taking a course in vocational education. Off-screen, Betty Anderson (Elinor Donahue), also a student in the course, waits to sign up to work with a surveying crew. Its members will include a college man who thinks women have no place in engineering. The episode will go on to treat sexual discrimination and harassment in a less than satisfying way, as Betty’s harasser falls for her; and she, for him. This card-file later had small roles in Dragnet and Car 54, Where Are You? before going into real estate. Threatening to upstage the card-file is an enigma. What, what is that cup-like object on the desk? 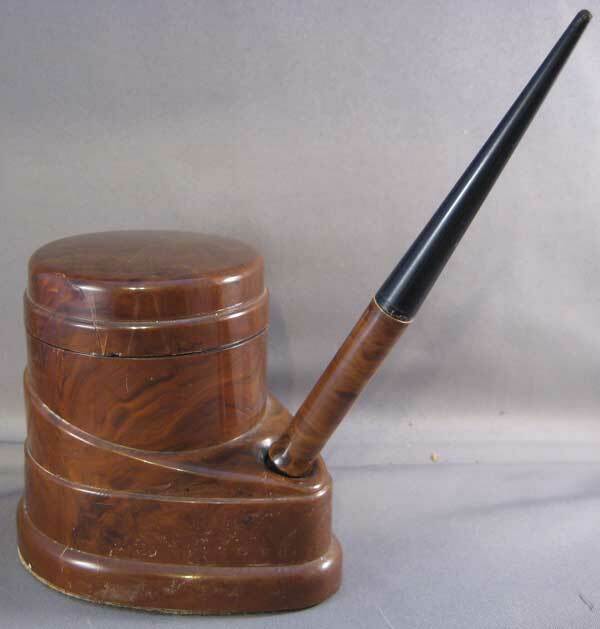 January 10, 2012: Looking at the enigma again, I think it might be the ink reservoir for a dip pen, minus the pen, something like this one. 3-D makes it easy for me to think about living with no TV. Brian you were a wonderful young boy and regardless of what you may think, I gave you very much love and I idolized you as a baby. You can never know how many hundreds of times I picked you up and kissed you and carried you on my shoulders, sang to you and taught you words, songs and so many things because you were a baby. I can remember giving all three of my sons love in many forms and actually, when I was strict from time to time, it was because I felt it was my duty as a father to give you the security a punishment gives. . . . I cannot believe that such a beautiful young boy, who was kind, loving, received good grades in school and had so many versatile talents, could become so obsessed to prove that he was better than his father. The food and drink I can do without easily. The jokes, gossip, laughs, arguments and shared memories I miss. Sentences beginning with the words, “Remember that time?” I ran in crowds where anyone was likely to break out in a poetry recitation at any time. Me too. But not me anymore. So yes, it’s sad. Maybe that’s why I enjoy this blog. You don’t realize it, but we’re at dinner right now. The next time I teach Homer’s Odyssey and talk about food and drink and hospitality in the poem, I’ll be asking my students to read Ebert’s piece. James Fawcett (Bing Crosby) seems not to care what anyone thinks about how he looks. 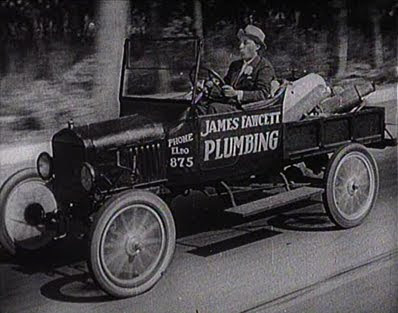 He’s a singing plumber (yes, Fawcett) in Waterville in this musical short, available on Hollywood Rhythm: The Best of Big Bands and Swing, Volume Two (Kino Video). Thanks, library. Sweetzels Spiced Wafers are tough cookies — crunchy, substantial, nothing wafer-like about them. The secrets of their flavor: unsulphured molasses and what the ingredients list calls “spices” — allspice, clnnamon, clove, and ginger. Spiced Wafers are like emotionally complicated ginger snaps — darker, moodier, more intense. Spiced Wafers are a seasonal item, sold in fall and winter. Once a Philadelphia specialty, they can now be had elsewhere. Elaine and I found them at a Big Lots in “east-central Illinois,” $2.00 for an 18 oz. box. We bought one box on Saturday and several more yesterday. How many are “several”? Let’s just say that we now have close to 2000% of the day’s iron stashed beside our wine rack. On an international note: Sideways has been remade as a Japanese film (dir. Cellin Gluck, 2009). Sideways, according to the trailer. Saidoweizu, according to IMDB. How old do you have to be to like Sideways? At least forty, I’d say. The Internet is amazing. Stay tuned for further developments. Tonight, at 9:30 Eastern Time, CNBC airs the documentary Welcome to Macintosh (dir. Robert Baca and Josh Rizzo, 2008). A bright new LED display will soon replace the schedule board at New Haven’s Union Train Station. The board to be replaced clicks clicks clicks as its letters and numbers flip. Did you know that this kind of board has a name, or several? It’s called a flip board, split-flap display, or Solari board, after its Italian maker, Solari di Udine. NPR reports that New Haven’s LED display will have a simulated click click click. If you teach, PDFCalendar is great for planning a semester on one page. 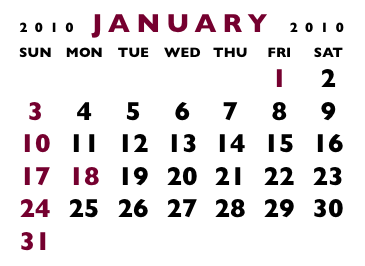 The UNIX command is handy for making a three- or four-month calendar to keep in a pocket notebook. It’s much easier to make than you might think: just two tables in a word-processing document. I used Apple’s Pages and Gill Sans Bold. Cartoon characters have fewer fingers than we do; their months, fewer weeks; their weeks, fewer days. And their trashcans, fewer lids. Looking for some resolutions? 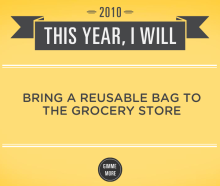 Try Monina Velarde’s New Year’s Resolution Generator.